Siccar Point is world-famous as the most important unconformity described by James Hutton (1726-1797) in support of his world-changing ideas on the origin and age of the Earth. Siccar Point is located about 35 miles east of Edinburgh near the village of Cockburnspath. It is tucked away, not on the tourist trail and not easily accessible (although by road it takes less than an hour to get there from Edinburgh). Siccar Point remains now much the same as when Hutton visited in 1788. 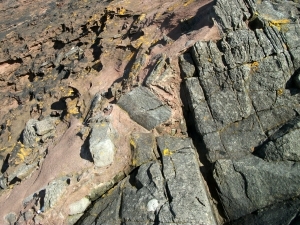 The junction between the older, tilted layers of greywacke sandstone and the younger Old Red Sandstone is clearly visible, allowing us to work out the story of the formation of these rocks; and appreciate, as James Hutton did, the evidence for an ancient Earth where natural processes operate over unimaginable lengths of time to create, alter and eventually destroy rocks. Hutton’s friend, John Playfair (1748-1819) accompanied Hutton and Sir James Hall on the boat trip to Siccar Point and summed up the importance of this visit by saying “the mind seemed to grow giddy by looking so far into the abyss of time“. away to the south, the land is high and quite harsh, where steep grey cliffs plunge into the wild North Sea, and there is not much sign of human habitation. The tough greywacke sandstone layers make up much of the Southern Uplands. to the north and west the landscape is lower, and gently rolling, with rich agricultural land and many signs of people in the farms, industry and settlements. This land is underlain by softer and younger sedimentary rocks such as the Old Red Sandstone. This is a fundamental boundary in another sense, for these rocks are from very different parts of Scotland’s geological story. The greywacke sandstone formed on the floor of the Iapetus Ocean around 430 million years ago, and was later crushed and upended during the closure of the ocean basin at the time of the creation of the great Caledonian mountain chain. The red sandstone came much later, around 380 million years ago, when the Caledonian mountains were eroding and large river systems brought sediment south into the broad, subsiding Midland Valley. See Resources page for some good books on Scottish geology. Every good book on geology mentions James Hutton and Siccar Point! 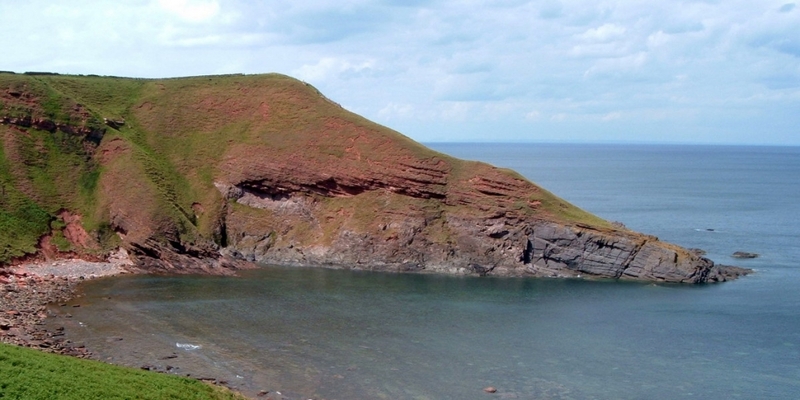 The Lothian & Borders GeoConservation group have two relevant leaflets, both available as free pdf downloads from the Edinburgh Geological Society website – Siccar Point | James Hutton. Scottish Borders Council published a very good leaflet in 2011 on Borders Brains walks, exploring the lives and ideas of the Berwickshire geniuses David Hume, James Hutton, Duns Scotus, James Small and Alexander Dow, in the beautiful landscape that gave them birth. You can download it here. But really – don’t just read about it, you should go and see this wonderful place for yourself… Visiting Siccar Point. Planning to visit Siccar Point? Check out maps and detailed instructions on the Visiting Siccar Point page. Get in touch with Angus if you have any questions, or would like to arrange a guided visit – Contact details. Check out the Siccar Point leaflet from the Lothian & Borders GeoConservation group, for further information about James Hutton and Siccar Point.